The Jenny Life: Is Online School Right for Your Child? Welcome to The Jenny Life! Life is not perfect, but it sure is fun! Lindsey's "classroom," efficiently located across from the frig. I've had so many people reach out to me when they discover that our eldest attends an online high school. They are interested in this option for their child for a variety of reasons, could it work for them? 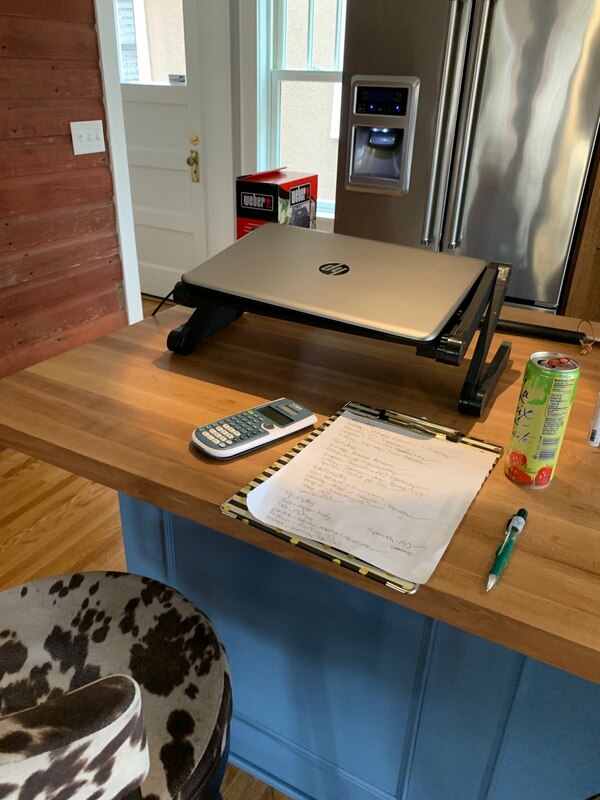 Lindsey's initial reason for attending an online school was to reduce her anxiety, which was like a burr under her saddle, getting rubbed every day that she attended a bricks-and-mortar school. All of her energy was going towards just existing at school; anything the teachers taught went in one ear and out the other. When she came home at night she was so exhausted from the emotional drain of it that she couldn't concentrate to complete her homework. We considered other options and eventually landed on online school. Sure, it didn't do anything to reduce her anxiety, but at least she could still learn in an environment that was healthy for her. What's that environment look like, you ask? Well...honestly, it's a teenager's dream. She sleeps in as late as she wants (within reason, I usually start coming around to bug her at 10). She has to attend each class once per week (once, not daily). She attends classes via a "live lesson," which is a webinar with an active chat session for students to participate in class. She doesn't have to deal with kids kicking her chair, distractions from other students' bad behavior, forgetting homework or other stressers. There is no high school drama. No one is talking behind anyone else's back, no one cares what she wears every day, there's no pressure to "fit in" because all her classmates are virtual. She turns her work in on her own schedule. The school has recommended due dates for the work so that students don't procrastinate and leave everything until the end, but there are no penalties for turning work in "late;" it's all about whether or not you understood the lesson and not the timeliness of when you understood it or how long it took you to complete. She takes breaks in the middle of the day as needed. This could entail laying on the couch with our dog, going for a walk, or running an errand with me. Sometimes she works through a ton of lessons in two days in order to give herself the third day off for a special outing. Basically, she's works for herself with no "boss" to ask her when she's coming in to the office, how many hours she's worked and when the projects she's working on will be done. They'll get done when they're done, on her own schedule, for the boss' evaluation and grading. It's a freaking dream. Except. She has to be incredibly organized. Self-motivated. Avoid procrastination. Figure things out for herself. Be independent, but know when to ask for help (and where and how). This photo is of her lesson plan she created for herself before our spring break. Her spring break and Marissa's did not coincide this year, but, since Lindsey's education is online, we agreed that if she could do her week's work in advance then she can work through her own spring break and go on vacation when her school was back in session. She had to have the motivation to work on these lessons every day, even though she did not have the support of teachers to call or lessons to attend to understand the material. And she did it, she got it done. This happens every day, not just the times she wants to take different time off away from school. Math is not a strong subject for her, nor is it for me. The other evening she worked on a single geometry problem for an hour. A full hour. She was determined to solve it. When she had exhausted her text book, recordings of live lessons, Khan academy and (last resort) me, she turned to her friends via text. Being the amazing, helpful and smart kids that they are, they helped her so that not only did she solve the problem but she understood the concept. I was in bed at 11:30 and heard her getting ready for bed, making more noise than usual. I thought she was frustrated, turns out she was elated. She was so excited that she finally figured out the problem and was grateful for her friends' help. Would you child do that? Would your child work on a single frustrating problem without screaming, without throwing a book, without giving up, for an hour until s/he solved it? Would you child create schedules for him/herself, follow them, and, if s/he got off-track, find ways to make up the work in a shortened timeline? Would s/he check in on grades on a weekly basis, call or email teachers as needed and negotiate workload with them? If not, then you may need to find other options for your child. The other piece of this puzzle that makes online school a good option for Lindsey is that I'm around and available all day long. When she first started she was working at home, by herself, all alone, all day long. She was unmotivated, somewhat depressed and isolated. We realized early on that there was no way a 14-year-old could be left to her own devices all day long with no human interaction and somehow succeed at school. A large piece of why online school works for her is because I'm here and available, both educationally and emotionally. If she's super frustrated, I recommend taking a walk. If she is taking too long of a "break," I gently encourage her to get back to work. I'll get her out of the house, encourage outings with friends, take her to field trips where she can meet her virtual classmates in person, and help her with the non-educational part of her school day. When she first began online school she was extremely isolated, but now that she's more confident in the classroom she is branching out, keeping in touch with her friends from middle school, making new friends in her online school, holding down a job and doing many other activities that help reduce her anxiety. She's in National Honor Society and as such has to do 50 hours of volunteer work every school year, which is also motivating to get involved in the community. Online school did not address her anxiety but it did reduce it. That's not the same thing. We reduced her anxiety by taking away something that made her anxious. As anyone familiar with this condition knows, when you do that you actually increase the person's anxiety about that thing. Now Lindsey is focused on her singular goal of going away to college. She wants the traditional college experience, even though she knows and we assure her that there are other options available to her. That's not what she wants, she wants to prove to herself that she can manage life in whole. We are slowly working on getting her back into classrooms, a driver's ed class this summer and in-person classes through the PSEO program at her high school. 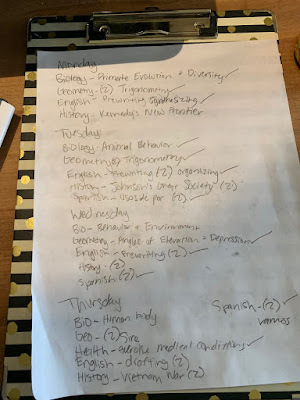 She will remain in her online school throughout high school; she's getting a great education and I see no reason to change it as long as she keeps progressing on her mental health in other areas. Online school has been a blessing to her and to our family. We already know that it is not an option for Marissa, who will be attending a traditional charter school next year, though she is envious of Lindsey's flexible schedule. Marissa does not want the responsibility of having to manage her own schoolwork, she would rather learn directly from teachers and have classmates in person for her to rely on for help and commiseration. For anyone who is interested in talking about online education, I am always happy to chat! Hopefully this will be helpful for anyone interested in it who would hesitate at picking up the phone or texting me. Thanks for reading! WordSisters | In it together–from inspiration to publication! The Spider and the What? Dogs, Can't Live with them, Can't live without them. A Diorama Dilemma: "Back in the Day..."